This is absolutely incredible in every damn way possible. Shaquille O’Neal, the “Big Shaqtus” and every other nickname his huge, 7’3 frame holds went crashing down on the TNT set during halftime of the Rockets vs. Clippers. Shaq hit the floor harder than that old plate in your grandma’s cabinet you’ve been wanting to smash forever. Shaq fell faster than everything in “Cloudy With a Chance of Meatballs.” The first and the sequel. Imagine the ground. That’s a small earthquake inside the studio. I don’t even know how the rest of the analysts didn’t rock out of their chairs from chain reaction from a literal giant falling to the ground ungracefully. I don’t know what’s worse, the graceful fall from your drunk uncle at a Christmas party crashing on your couch or the large seismic shock that comes from Shaq cracking a few tiles. 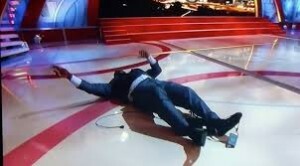 It’s not Blackhawk down, it’s Shaqhawk down. Man, Sonny Liston didn’t hit the mat faster than Shaq. Jerome Boateng didn’t get crossed up for this.This is bad. Everyone must remember the day that Shaq broke the Earth. The TNT set will never be the same. This is worse than when Kenny pushed him into a Christmas tree.